In 1884, a certain William John Macnider of Greensborough, Georgia, applied for a patent for keyboard adding machine. The patent (US patent No. 322190) was granted on 14 July, 1885 (the administrator of the patent was Quintin Macnider, as William Macnider died meanwhile). 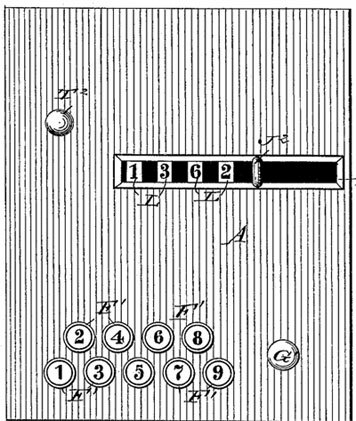 After the first keyboard adding machine of Luigi Torchi from 1830s, there are quite a few patents for one-column keyboard adders, especially from 1880s in USA (for example the adding machine of Andrew Stark). The keyboard adder of Macnider (see the lower patent drawing) seems like a very well designed device, unfortunately nothing is known about this machine and its inventor. We can suppose however, that William John Macnider was a member of the famous Scottish-Canadian family Macniders (businessmen and politicians), because the administrator of the patent, Quintin Macnider (obviously a relative of William), was from this family. Quintin, who lived in Belleville, Ontario, Canada, until his death in 1895, was a shareholder and the manager of the local branch of City Bank of Montreal. Moreover, Quintin Macnider was a holder of another US (and also Canadian) patent (US355095 and CA26172) for a step ladder from 1886. Let's examine the adding machine of William Macnider, using the drawing from Scientific American. In the patent application only four adding wheels are shown, but as many as may be desired may be provided. The entire mechanism is contained in a box on the bottom of which are pivoted two standards, having a shaft journaled in their upper ends. On the shaft are rigidly mounted nine ratchet wheels, adjoining each of which is a lever mounted to rock on the shaft, and having a pawl pressed by a spring against the teeth of its wheel. 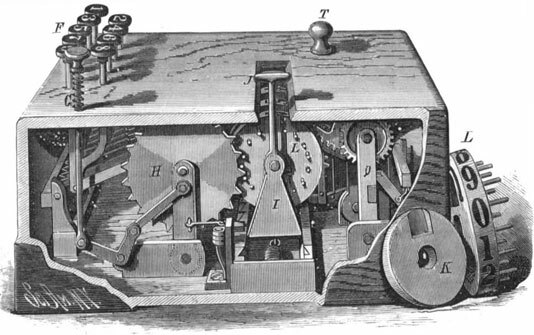 Each lever is connected by a wire with an arm pivoted on a standard, and pressed upward by a spring. The wires and arms are of different lengths, so that from the same vertical throw of the different arms the ratchet wheels connected therewith will be turned different distances. Rods or push pins project upward through the top of the box, and are provided with heads, F, arranged in two rows, the even numbers being in one row, and the odd numbers in the other. One of the pivoted standards is connected by a rod and elbow lever with a push pin, G, having a head at its upper end; this push pin is pressed upward by a spiral spring. The wheel, H, is rigidly mounted on the shaft, and is provided on its rim with triangular teeth. Two standards, I, united by a bottom plate, slide transversely on a support in the bottom of the box, and carry a shaft on which hubs, K, are rigidly mounted. Adjoining each hub is a loosely mounted wheel, L, having a circular row of ten pins projecting over the hub corresponding to the wheel, and between these are nine shorter pins arranged so that a blank space will be left between two of the longer pins. On that surface of each wheel, L, opposite the one from which the pins project, is pivoted a pawl, the free end of which is connected with a spring throwing the outer end of the pawl outward, so that when it comes opposite the recess in the hub K, it can enter the recess and engage with the long pins of the next wheel. From one of the standards, I, an arm, J, projects upward through a transverse slot in the top of the box. On the rim of each wheel are the numbers 1 to 0 inclusive. A pawl pivoted on a standard, and pressing against a rack formed on the front edge of the plate uniting the standards, I, is connected by a wire with the pivoted standard. In the rear of the box are two standards, Q, pivoted to swing in a vertical plane, and united by a cross piece and a shaft journaled in the top. On the shaft are mounted as many cog-wheels as there are wheels, L, the cog-wheels passing in between the wheels, L, and engaging with tho long and short pins. On one end of this shaft is a pinion engaging with a gear pivoted on one of the standards, Q, and an arm, this gear being connected by a fixed cam with a pinion. Sliding vertically in a standard is a bar, T, projecting through the top of the box. This bar is so connected that by properly manipulating it the numbered wheels may be made to show 0 in the opening; the cog-wheels refusing to move the wheels, L, when the teeth meet the vacant space between the pins. The push pins, F, are all depressed the same distance, and throw the levers through the same arc; and as the levers vary in length, the arms connected therewith will be thrown different distances. If the push pin, 2, be depressed, its wheel will move two teeth, and if 8 be depressed, its wheel will move eight teeth, and so on. To add the numbers 2, 1, 5, and 3, the proper pins are depressed successively, and the wheel, H, is moved eleven teeth. When the first wheel has revolved ten teeth, its pawl passes into the recess in the adjoining hub, and the second wheel is turned one space, so that the number 11 will show through the slot. The first wheel is no longer needed, and is shifted out of use by pushing the rod, G, downward, whereby the wheel, H, is disengaged from the first wheel, L, and a spring is allowed to pull the carriage carrying the standards, I, one tooth on the rack, when the wheel, H, will engage with the second wheel, L. The second column is added, and then the wheels are shifted again.